On Tuesday, the new Sheraton Hacienda del Álamo Golf & Spa Resort opened its doors in Murcia after receiving an investment of 8.6 million euros. The property is owned by the Sareb and will be managed by Adh Hotels in collaboration with Marriott International . 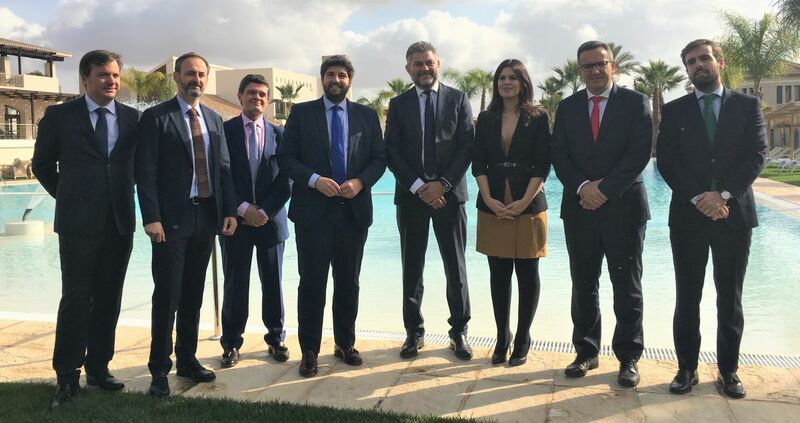 The resort was inaugurated on Tuesday by the president of the Asset Management Company from Banking Restructuring (Sareb), Jaime Echegoyen; the president of the Region of Murcia , Fernando López Miras; the general director of Adh Hoteles, Carlos Berrozpe, and the expansion director for Spain and Portugal of Marriott, Edgar Ollé. The hotel complex, located in the municipality of Fuente Álamo, is the first Sheraton in the Region of Murcia and the fourth in Spain. It will be open all year and has created 160 direct jobs. The Sheraton Hacienda del Alamo Golf & Spa Resort has a four-star hotel with 154 rooms and suites that is located within a resort of 38,000 square meters, with some 1,300 villas and homes of which some 900 are already sold, while the rest continue in the hands of Sareb, which also has land to build up to 1,900 more properties. From left to right: García Conesa, Javier Celdrán, Jaime Echegoyen, López Miras, Carlos Berrozpe, Miriam Guardiola, Diego Conesa and Edgar Ollé. One of the main attractions of the resort is its 18-hole golf course, designed by the famous golfer Dave Thomas. It has 92 hectares and is the longest of all the Spanish southeast. In addition, it has an area of outdoor swimming pools, paddle tennis courts, tennis, volleyball and basketball, soccer field, and a wellness area with spa and wellness. It also has a full congress area with large rooms of different capacities and specific services for the realization of professional forums, corporate events and social gatherings. Adh Hoteles, a hotel company of Grupo Avintia , reinforces with the opening of this hotel its position as an international multibrand manager, expanding the range of establishments that it operates together with top-tier firms such as Hilton Worldwide, Grupo TUI and Accor International. The president of Grupo Avintia, Antonio Martín, has highlighted the collaboration and coordination between three agents, such as Sareb, Marriott International and Adh Hoteles “to offer an innovative and high-quality project that has been paralyzed until only a year ago”. For Jaimen Echegoyen, this project is an example of how Sareb, known as the bad bank and created to divest some 51,000 million euros, sometimes has to invest to later be able to fulfill its objective and, in this case, it is done inside of a project that is committed to a new tourism based on sport. In the same line, López Miras has also put in value this diversification of tourism for which the regional government is committed, in which the promotion of sports tourism is one of its priorities. Sareb took over the management of this complex in 2013 from Catalunya Caixa during its restructuring process, and in these five years it has invested some 10 million euros in its maintenance, in addition to the 8.6 million start-up. Hacienda del Álamo is one of the three resorts that La Sareb has in the Region of Murcia, along with Mar Menor Golf & Resort and Las Terrazas de La Torre Golf Resort, both in the municipality of Torre Pacheco. In addition to the representatives of Sareb, Adh Hoteles, Marriott and the President of the Region of Murcia, Antonio Jesús García Conesa, Mayor of Fuente Álamo, was also present at the opening ceremony;Javier Celdrán, Minister of Employment, Universities, Business and Environment of the Region of Murcia, Miriam Guardiola, Minister of Tourism and Culture of the Region of Murcia; and Diego Conesa, delegate of the Government of the Autonomous Community of the Region of Murcia.